Hire this venue for your own event - it has one function room which can hold a maximum of 12 guests. Centrally located in Fitzrovia, it's a short walk from The Rathbone to Oxford Street, Soho and London's theatre district. With high speed wireless broadband available in all bedrooms and public areas (for a fee), it is ideal for both business and leisure guests. 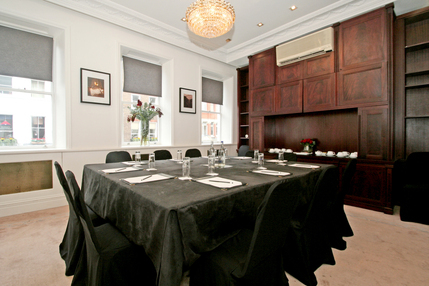 The Fitzroy Suite is available to hire as a meeting room, ideally suited for small meetings and training seminars for up to 12 people. Blessed with natural light and overlooking the iconic Charlotte Street in Fitzrovia, it provides a unique option for such events. There is also the option to hire the room on a day or half day basis, as well as a day delegate rate which includes morning coffees, light lunch and afternoon tea. From cheap budget hotels to luxury 5 star suites see our discounts for The Rathbone Hotel hotels, including Grange Tower Bridge Hotel from 56% off.